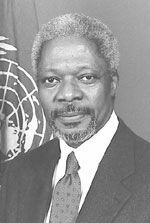 The Conference of Heads of Government of the Caribbean Com-munity has expressed concern over recent attacks on Kofi Annan, Secretary-General of the United Nations. âThe Heads of Government are concerned by these attacks and take this opportunity to express our continued confidence in you and your commitment to the ideals of the United Nations,â the statement said. The Heads of Government statement also said the community was cognizant of the fact that 2005 is likely to be a seminal year in the history of the United Nations and believes that his leadership is vital to the organization at this time.